While the start of a new school year comes with excitement for kids, it also comes with stress. It’s common for kids to feel overwhelmed this time of year especially as they navigate the challenges that crop up with a new school year. This stress can manifest itself in stomachaches, headaches, loss of appetite, even depression. Here are five common back to school stressors and how parents can help their kids to bust them. For kids who are bullied, summer break also means a break from the relentless verbal and at times physical abuse that can be crushing to a kid’s self-worth. Oftentimes kids won’t tell parents that they are being bullied because they are embarrassed or fear telling school administrators will only escalate the bullying. As the school start date approaches, pay attention to your kids’ anxiety level. Communicate and ask them what they are looking forward to this school year. Ask them who are they most excited to see when they return to school. Listen for any negativity and seek to understand where it comes from. Ask if they ever witnessed bullying and what they would do if they did. If your child reveals that they don’t want to see a certain group of kids, ask why and get as much information as you can. You want to show your kids that they have your support without judgment. Kids who once did great may enter the new year and feel overwhelmed with the additional school work. Perhaps they aren’t grasping the material as quickly as they once did. This is common, especially in math at the junior high level. Once parents can no longer help kids with homework, they may want to invest in tutoring. Before selecting a tutor, it’s wise to have your children be evaluated to get clarity on how they learn best. Some kids are visual learners, making a math tutor who helps the student to “see” how the equations play out in visual analogy tremendously helpful. Another solution that can benefit the whole family is hiring a time management or accountability coach to help the everyone manage schedules effectively. With the skyrocketing cost of education, many kids listen to parents discussing the stress they feel about college tuition and then take on that stress themselves. Money is a stressful topic because it is usually never spoken about openly and honestly. Some students may wonder if college is even a right option for them but fear voicing this opinion. Many feel that higher education leaves them ill prepared for “the real world”. Many parents and kids question the value of the six-figure tuition price tag. There has been a slow shift away from traditional education in favor of entrepreneurship. Perhaps an internship at a small business a few days per week after school can provide your kids with more hands-on experience on a path that truly interests them and can be even more lucrative. Showing your kids there are many ways to achieve success presents options they may not have ever known existed. 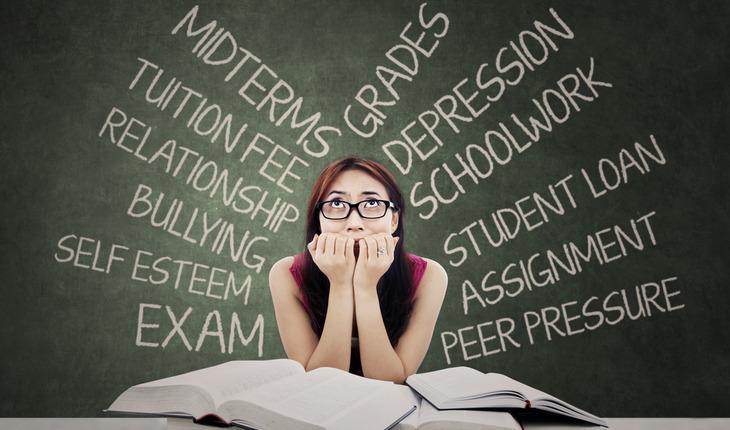 Whether your child is starting school for the first time or entering junior high, high school or college, anxiety is common when they are uncertain. Anxiety doesn’t discriminate and older kids get anxious about the unknown just the same as the younger kids do. It’s common for small children to have separation anxiety at the start of school and for homesickness to strike college freshman living away for the first time. Touring the school, getting to know teachers in advance, and getting as much information beforehand as possible helps kids to prepare mentally for what they can expect. The return to school comes with the return to more kids and more social drama. Usually in the summer, kids stick to their immediate group of best friends. During the school year, they are forced to get along with everyone. The gossip and constant pressure to fit in can cause anxiety. Simple things like choosing clothing, hairstyle and over all appearance can cause a lot of pressure. Teens especially are trying to get a handle on body image and often feel anxious about being judged by other kids. It’s important to be supportive and understanding while reaffirming your child’s strengths and larger goals. When your kids are busy focusing on what they want to achieve and what they enjoy doing, they’re less likely to have time to concern themselves with the opinions of others.